I cannot tell you what an honor and a privilege it was to photograph this beautiful and courageous Duxbury family last week! I first learned of Lindsay's story when a group of her loving friends anonymously and generously purchased a surprise photo session for her family ~ the proceeds of which I will, of course, be donating straight back into the cause! Upon meeting the McGraths, I was struck by their stunning smiles, their palpable strength, and incredible spirit. Photographing Lindsay, her husband, and her ADORABLE children was a true and total delight. Witnessing the astounding outpour of love and support from the little town of Duxbury was touching beyond words. It reminded me of how lucky and proud I am to be from such a tight knit community. And please #JUMP FOR LINDSAY! A Classic Duxbury Family Portrait Session ~ The Beach & Ice Cream! What do you do when your you're adorable little girl is having a tough day and even the Duxbury Beach doesn't cheer her up? You take her for Ice Cream at Far Far's, of course! The Sweetest Twins You Ever Did See! 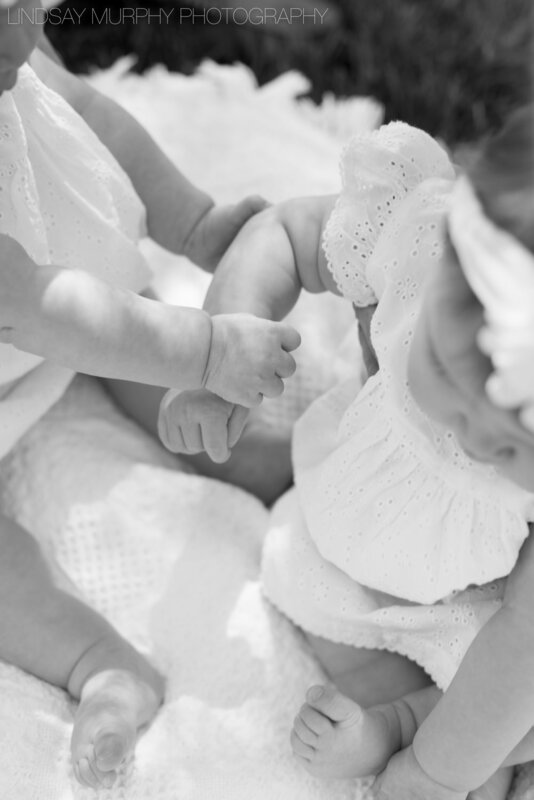 When I photographed these little ladies as infants, I didn't think they could possibly get any cuter! Boy, did hese twin girls prove me wrong! Look at these smiles! Not surprising considering their gorgeous parents! It was such a pleasure photographing this stunning family in Duxbury! Happy Babies on Beautiful Beaches! So, Davis may have been the HAPPIEST baby I have ever photographed! To say that it was a pleasure running around on Scituate Harbor with her and her lovely parents would be an understatement! Check out these amazing expressions! Baby Cuteness! A Family Portrait Session on Duxbury Harbor! This little lady's expressions are beyond adorable! And it was such a pleasure wandering around the beach capturing each and every one! I loved photographing this cute little family while back in New England! All Smiles... A Duxbury Beach Family Photo Session! I feel so lucky to have met and photograph so many awesome families last week in New England! THIS little family could not have been cuter! Words cannot adequately describe the smiles, the expressions, the laughter, and the love thrown around that day on the beach in Duxbury... the photographs speak for themselves! Such a sweet and beautiful family! Enjoy!